It seems like everyone on my facebook friend’s list is doing the whole “Day 21: I’m thankful for _____” in their status this year. I didn’t get the memo until a few days late, and really, I’m pretty sure I would have forgotten several days and then would have felt like I failed at something else, so… for the sake of my pride, maybe it’s a good thing! I thought, instead of Facebook, I’d blog all at once all the things I’m thankful for, one for every day up to Thanksgiving. I’d probably have to have one for every day of the YEAR to be all inclusive, but this is some of it anyway. Parents who raised me to serve Jesus and to dream big, who laugh with me, encourage me, pray with me, and stand by me, holding up my arms when I’m about to fall. A husband who stands beside me despite my weirdness, who encourages me to trust instead of doubt, and who picked up the load of bricks that I dropped on the ground and now carries them for me. You are my hero, sweetie. Kids who trudged through this past year like troopers, who loved me even when I didn’t deserve it, and who smother me with the most WONDERFUL hugs and kisses a Mommy could ever get! Parents-in-laws who make the trek out here many times a year to visit, who have taught me the true meaning of a giving heart, and who set an example of what it means to be a servant this past year. Sisters who I can pick up the phone and tell them exactly how I’m feeling, and hear a very honest and loving, “Krista, you’re being stupid. Stop.” back. Sometimes… we just need to hear it like it is! These same sisters listen to all my woes, pitch in and help a girl out by cleaning her house or watching her kids or taking her for a therapeutic pedicure. Vanderbilt Children’s Hospital, and all its doctors, nurses, respiratory therapists (waving to Miss Brittney!) and the rest of the staff who worked tirelessly to save my daughter’s life. A special thanks goes to our primary nurses in the PICU, Miss Ashley and Rachel for dedicating those months to my Annabelle and for caring for her better than I could have ever asked. Chocolate. I firmly believe God made chocolate to help us get through times like this past year. No one will ever convince me otherwise. My Church Family. More than I could name blessed our family with meals, anonymous monetary gifts, house cleaning, Christmas gifts for our kids, gift cards, and even vet care for our dog! We are very blessed to be a part of that family. Unnamed people. I didn’t talk about it a lot out of respect for them, but so many people helped us out this past year, and we don’t even know who they are! Numerous times Scott would come home, and someone had slipped an envelope of money under the door. One time, a stranger came up to him at work with an envelope of money saying, “Someone said to give this to you.” Or giftcards in the mail with no return address. It was humbling, to say the least, but we would not be where we are today, still able to pay our mortgage and put food on the table, if it hadn’t been for these people. For a time over the summer, we were making almost nothing after my job ended. And even though our income is less than half of what it was before Annabelle was born, still, we’re able to keep going as a direct result of the gifts from others. This is nothing we ever asked for, but give thanks to those who gave. My Alley Cats and other writer friends. I blog with a group of 9 other women at thewritersalleys.blogspot.com. During this past year, they have not only been a huge prayer support and encouraged me to not give up on my writing through this process, but they also showed with their actions their love. While Annabelle was in the hospital, they sent regular care packages with a variety of things that just showed the love of Jesus to me and my family. Other writers/authors have helped too, in sending books to help me bide the time at the hospital (Mary Connealy and Jenny B Jones, to name a few) and in sending notes and gifts of encouragement, such as the oh-so-wonderful Keli Gwyn, and the support, prayers and love from my local writer’s group, MTCW. So many others who gave to us, many strangers who only knew me from this blog or a friend of a friend, the list is just too long to mention them all, so I’m not going to even try. I’m ashamed to admit, many of them didn’t even get an official thank-you note, as whenever I tried, something would happen with Annabelle and my time would be diverted. I know everyone says, “Don’t worry about it” but I do, and I feel bad. So, please accept this as my belated thank you note, and with heartfelt appreciation know that your gift to us was not unnoticed. The thousands who bathed us in prayers. I can’t begin to name all the prayer lists I was told Annabelle was put on! During our darkest time, so many prayed with us, even from afar, and just knowing how many voices were being lifted to heaven on our daughter’s behalf still brings tears to my eyes. There is power in prayers, and I think we could have lit the whole city up with lights as much power was being generated! Abingdon Press, my publisher, and Ramona Richards, my super cool editor, for taking a chance on this fledgling writer and agreeing to publish my first book. I still have to pinch myself!! Rachelle Gardner, my super cool Wonder Woman Agent, for agreeing to represent me and for walking an ultra green author through this crazy process that is publishing. All my heart Momma (and Daddy!) friends, for walking this journey with me, for sharing in the really high highs and the unimaginable lows. Every single one of you are so very special to me. For those who had “gone before” you’ve shared your wisdom and experience with this newbie-heart-Momma, and for those of you who have been walking this journey with me, we’ve learned together! It’s not a path we would have chosen, but walking it with you has made it bareable. Special thanks go my heart Momma friends, Melissa and Tosha. Melissa, you showed me Jesus’ love this past year, we’ve fought for our babies side by side, laughed together, cried together, and learned together. You are beyond special to me, my friend. We still need to write that book:-) Tosha, our time together was shorter, but just as sweet. I’m so thankful you chose my door to stand beside in your moment of pain, and that I listened when God told me to give you a hug. I’m normally not a “go up and hug a stranger” type of girl! I’ve learned a ton from you, and I count it an extreme privilege and honor to know you and to have loved James with you. 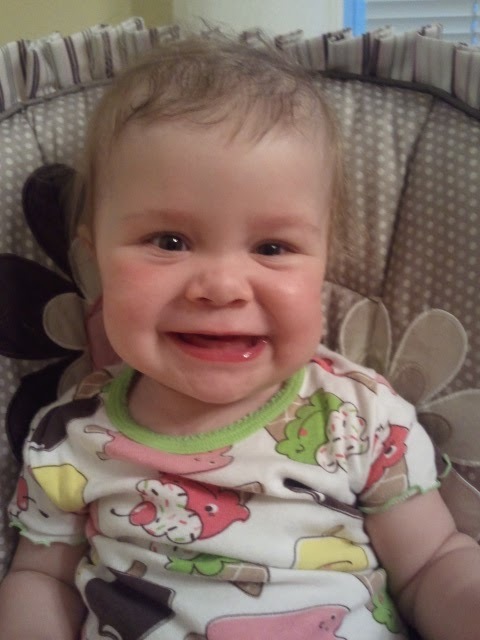 You, my friend, taught me to fight for my daughter, and it is a lessen I needed greatly. Health Insurance. Our bill since Annabelle was born was net over 3 million dollars. Yes, I am VERY thankful for health insurance! volunteer their time, with no compensation at all, at that hospital. able, I can give back ten-fold. 21. 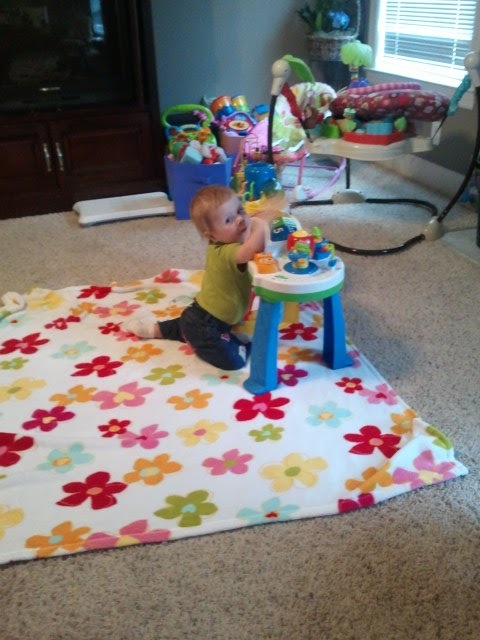 A little girl who pulls to her knees (kinda..) on her toy for the first time! Oh Krista! I love reading your list. While you've had such a traumatic year, I can see that you've been blessed many times over. No one would ever accuse you of being ungrateful! You are one super-cool gal! Sherrinda… yes, the blessings have been heaped onto my family this year!!! I am undeserving… but oh-so-thankful! It's wonderful to see how many blessings were tucked amidst the trials you endured this past year. 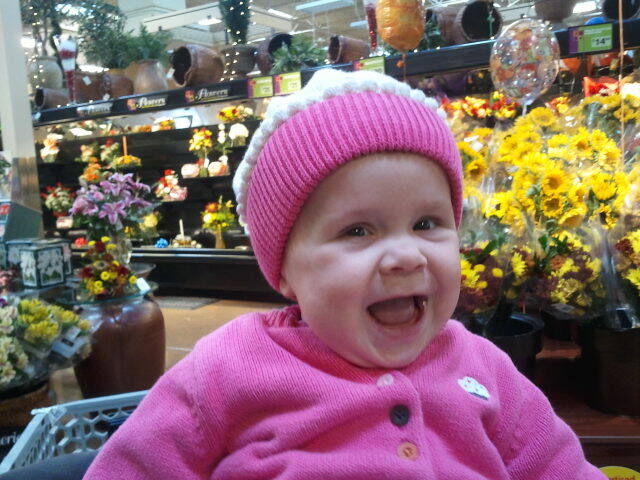 Pictures of that sweet baby smiling starts my day off right. She is my screensaver at home and work, updated everytime you update pictures on your blog! Thank you for sharing your life and your very special daughter! My eyes are clouded with tears, — oops, one just escaped and is slowly trickling down my face. I loved reading your list. If a made a complete list, it would be very similar to your list. First, God, than my husband, children, extended family, church family, my son's care-givers (doctors, nurses, etc. ), God's provision in needs both physical and emotional (and one of the ways He does that is through blogs of other heart moms and families), and that is just the top of the list. Thanks so much for sharing your journey with us (both the good and bad). It is such a blessing to me, especially since I've traveled a similar road. Your words have brought such great comfort. May you have a wonderful day of Thanksgiving. Thanks so much for sharing your journey with us. It is such a blessing. Awww! I love it. I am so thankful that I was able to care for Miss Annabelle. She (and your family) have blessed me in so many ways! I love your list. There are so many things to be grateful for – thanks for jogging my memory of the things I need to thank God for. Wishing you and your gang a Happy Thanksgiving! Krista, I'm honored to be on your list, and I'm thrilled you're on ours. I hope you and your family have the best Thanksgiving ever. What a remarkable year you've had. So glad to see how your family and your precious Annabelle has grown and prospered since then.